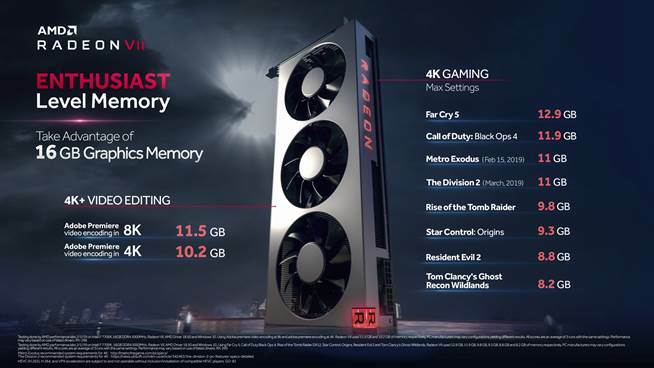 Today, AMD announced the availability of the world’s first 7nm gaming graphics card, the Radeon VII, bringing exceptional performance and amazing experiences for the latest AAA, eSports, and VR titles, demanding 3D rendering and video applications, as well as next-gen compute workloads. • 60 compute units, 3,840 stream processors and clocks up to 1,750 MHz drive high-performance gaming and hyper-realistic images. • 16GB HMB2 with 1 TB/s memory bandwidth and a 4,096-bit memory interface enable ultra-high resolution textures, hyper-realistic settings, and life-like characters. • Exceptional DirectX 12 and Vulkan performance, including improvements of 35 percent in Battlefield V and 42 percent in Strange Brigade compared to the Radeon Vega 64. • Performance to drive 3D rendering, video editing applications and next-generation compute workloads, including up to 27 percent higher performance in Blender, up to 27 percent higher performance in DaVinci Resolve 15 and up to 62 percent higher performance in the LuxMark benchmark compared to Radeon Vega 64. • As the world’s largest ecosystem of adaptive sync gaming display technology, Radeon FreeSync offers more than 550 supported displays, delivering smooth, stutter-free gaming at every price point. Radeon FreeSync 2 HDR offers more than 2X better brightness and color volume compared to sRGB.